If the previous story, State of Decay, could be said to depict Doctor Who at its most traditional, then Warriors’ Gate is certainly a trip into the unknown. The inexperience of key members of the creative team is definitely a reason for this – as they didn’t necessarily know the rules then they didn’t realise when they broke them. For some, particularly director Paul Joyce, it was a bruising experience as he came up against inflexible BBC bureaucracy. Script editor Christopher H. Bidmead was keen to get new writers onto the show and Steve Gallagher seemed to fit the bill. Gallagher had plenty of ideas but had no experience in television script-writing, but he had previously written radio plays and also had just seen his first novel published. Bidmead was later to comment that Gallagher’s draft scripts did read like a novel, as they included many unnecessary descriptive passages. Bidmead, with some input from Joyce, set about the task of distilling Gallagher’s scripts into something workable. Along the way he included some ideas and concepts of his own, such as the I Ching. Whilst Steve Gallagher was initially aghast at the treatment of his scripts he was later to appreciate the reasons for Bidmead’s ruthless rewrites and he would be better prepared when he came to write Terminus a few years later. Like Gallagher, Paul Joyce was also very inexperienced in television terms, with only a single Play for Today on his cv. Joyce had hoped to direct this story in a filmic style but the reality was that this simply wasn’t achievable at this point in Doctor Who’s history. Joyce’s preferred way of working was to shoot scenes a couple of times and then assemble everything in post-production. But as the recording time for each story was strictly limited this caused numerous delays and was very unpopular with the BBC technical staff. Each Doctor Who story was allocated a number of studio sessions and all the material for the story had to be completed within that timescale. At the end of the recording day the sets would be removed as the next day another production or programme would need the space. Overruns were extremely costly – at 10pm the lights went out whether everything had been completed or not – and even worse was the prospect of a remount, where another studio would have to be booked and the sets reassembled. The director lacks a working understanding of the methods used to make programmes in BBC television studios. His shooting ratio must be near the 10:1 level of a feature film production. He expects a 360 degree panorama to be continually available to the ‘hand held’ camera and the lighting and sound problems are endless. If the BBC is really interested in quality and economy, no Technical Operations crew should be subjected to such self-indulgent incompetence. It’s therefore no surprise to learn that Paul Joyce was never asked to direct another Doctor Who and it could be that this experience was one of the reasons why producer John Nathan-Turner tended to favour the likes of Peter Moffatt and Ron Jones in the future. They could best be described as “journeymen” directors and he could guarantee that they’d get the show made on time and on budget. Indeed, there wouldn’t be another Doctor Who story directed with such flair as this one until Graeme Harper helmed The Caves of Androzani in 1984. But for all the production problems we are left with a story that is visually very arresting and although Joyce still bemoans that the final product is comprised, enough remains to mark this out as something very different. The opening tracking shot, which takes us through the spaceship and up to the bridge, is a clear statement of intent. The hand-held camera work gives the shots a fluidity of movement which would have been impossible with the traditional rostrum cameras. Whilst not all of Steve Gallagher’s concept and story made it to the screen he was very clear that Cocteau’s Orphee and Testament d’Orphee would be key texts that needed to be understood in order to visualise the story. Joyce certainly took this on board and the production design reflects these influences, for example in the stylised black and white deception of the world on the other side of the Gateway. Joyce was able to recruit some quality actors, including Clifford Rose as Rorvik (best known at this time for Secret Army) and Kenneth Cope as Packard (a familiar face from Randall & Hopkirk). Rose likened Rorvik to Captain Mainwaring in Dad’s Army since he was the leader of a group of men who are less than competent and are never quite able to follow his orders out. By the end of the story, Rorvik has lost his grip on reality completely as seen in his final moments as he prepares to blast the Gateway, killing himself and all his crew in the process. Given the denseness of the original script, it’s possibly not surprising that it doesn’t all make sense. Some sections are particularly inexplicable – the cliff-hanger ending to episode three looks wonderful as a horde of Gundan Robots attack the Doctor and the Tharils in the banqueting hall, but how only the Doctor manages to move in time from the past to the present isn’t clear at all. GUNDAN: There were always slaves from the beginning of time. The masters descended out of the air riding the winds and took men as their prize, growing powerful on their stolen labours and their looted skills. DOCTOR: Yes, well, look, look, I’m sure this is frightfully interesting. Could you get back on to the bit about the gateway, please? GUNDAN: The masters created an empire, drained the life of the ordinary world. DOCTOR: Your ordinary world. I’m from N-space. GUNDAN: They came from the gateway. GUNDAN: There are three physical gateways and the three are one. GUNDAN: The whole of this domain, the ancient arch, the mirrors. DOCTOR: The thing is, it’s not actually a physical gateway that I’m looking for. GUNDAN: All the gateways are one. DOCTOR: Ah. So it is here. The way out. It later becomes clear that the Tharils were the enslavers that the Gundans spoke of and now ironically they find themselves enslaved by the likes of Rorvik. With the help of a Time Lord then can travel through E-Space releasing the Tharils held captive on other planets. Although as it’s often been assumed that Rorvik and his crew came from N-Space and only ended up at the Gateway (the dividing line between N-Space and E-Space) by accident, who are holding the Tharils in captivity in the rest of E-Space? 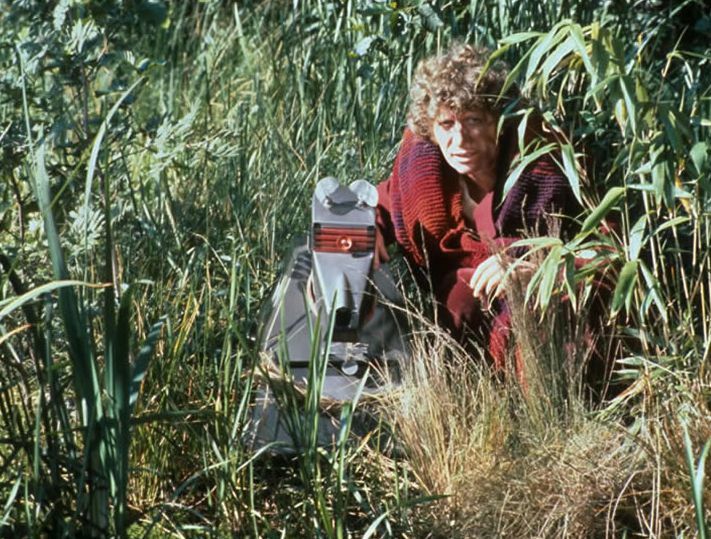 Although sidelined a little, Tom Baker does have some nice moments, particularly when he faces off against Rorvik. 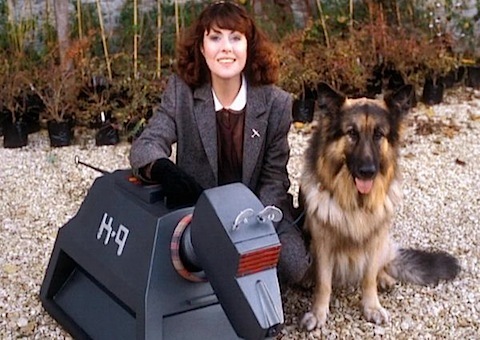 This story is, of course, notable for featuring the departures of Romana and K9 Mk 2. It’s quite a hurried farewell (not quite as bad as Leela maybe, but close) but had Baker or Ward wanted to add anything they probably could have, so they must have been happy with it at the time. Rorvik’s suicidal attempt to break free has destroyed his ship (and inexplicably freed the imprisoned Tharils and also sent the Doctor and Adric back into N-Space). But back in the old home universe, this Doctors days are looking distinctly numbered …. In retrospect, State of Decay by Terrance Dicks looks totally out of place in S18. As already touched upon in my article on Full Circle, new script editor Christopher H. Bidmead was a man who wanted the Doctor Who stories he commissioned to have a strong scientific basis. If there’s one thing he disliked it was scripts which paid homage to/ripped off other films, books or television programmes. Therefore it’s no surprise to learn that Bidmead didn’t commission the story, instead it was new producer John Nathan-Turner, who whilst leafing through a pile of unmade stories found a submission entitled The Vampire Mutations from a few years earlier. 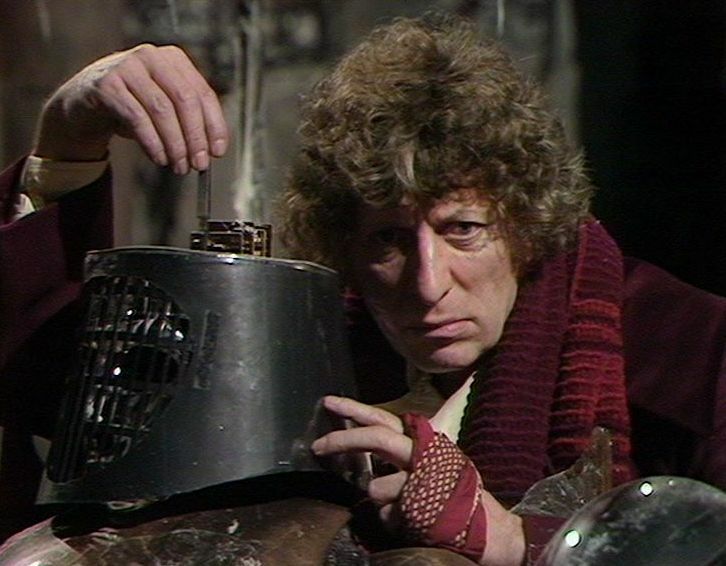 Doctor Who had been borrowing from other sources for a long time, for example other Tom Baker scripts by Terrance Dicks include Robot (King Kong) and The Brain of Morbius (Frankenstein). 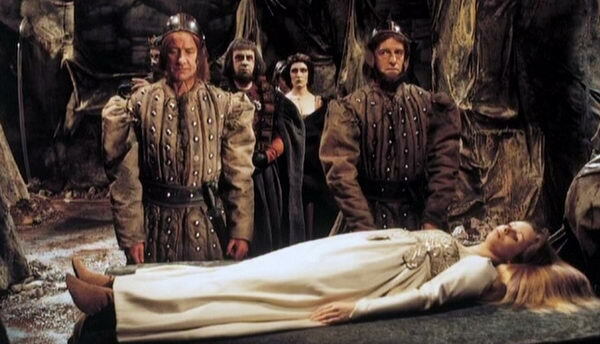 Indeed, the only surprising thing about State of Decay is that Doctor Who hadn’t tackled a vampire story before. Despite Bidmead’s misgivings (and he did attempt to crowbar some of his ideas into the story, much to Dicks’ chagrin) the story went into production. And if it wasn’t clear from the script that this was Doctor Who meets Dracula then the design and costume should have made it explicit. To be honest, there’s no logical reason why the inhabitants of the Hydrax should have chosen to dress like they’ve just walked off the set of a Hammer film, just as there’s no logical reason why Morbius, one of the greatest scientists in the galaxy, should choose to live in a castle that looked just like Baron Frankenstein’s castle instead of working and living in a modern laboratory. But it does work in a visual sense, so sometimes you have to accept that style has to win out over content. If Terrance Dicks was unabashed about borrowing from other sources to create his story, then it’s fair to say that his other writing traits are also present and correct here. For Dicks, the Doctor should always be central to the action. 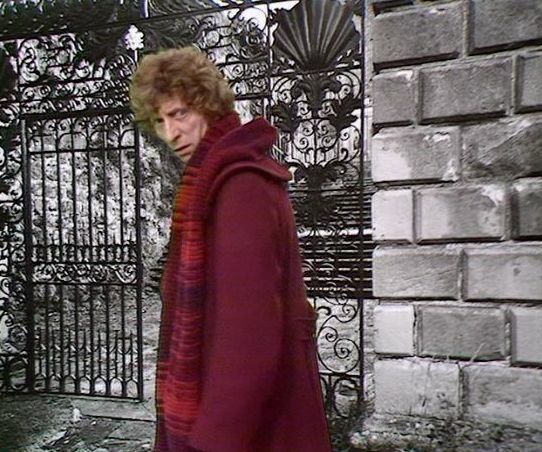 Other stories in S18, particularly the forthcoming Warrior’s Gate, depicted the Doctor as a passive figure, not much more than an observer who does little to resolve matters. This certainly isn’t the case in State of Decay where the Doctor has the lions share of the plot. Terrance Dicks was also well-known for his opinion that the companion existed to get into trouble and be rescued by the Doctor. He has two here – Romana and Adric – to fulfill that function. Romana does seem a little underwritten by Dicks, for example when she’s held captive in the final episode there’s not much spark. It’s tempting to suppose that he wasn’t really writing for Romana – possibly more for a generic companion along the lines of Jo or Sarah. The peasants aren’t particularly well drawn and they tend to conform to fairly common stereotypes – the weary head man of the village, the hotheaded rebel, etc. 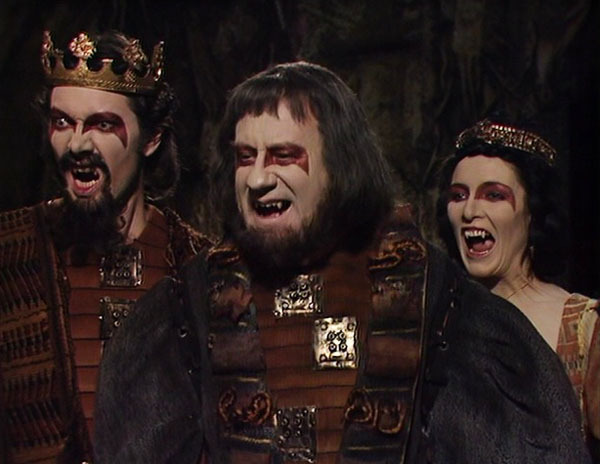 The Three Who Rule are more fun though – particularly Aukon (Emrys James). James was an actor of some distinction, a former RSC player, and although he can’t resist laying on the ham it was probably difficult not to. Zargo (William Lindsay) and Camilla (Rachel Davies) underplay a little more and are very effective. Particularly when Zargo confesses to Camilla that he is afraid. A small character beat, but quite a revealing one. KALMAR: Some of us could still read. It’s forbidden, but the knowledge was passed on in secret. KALMAR: All science, all knowledge is forbidden by the Lords. The penalty for knowledge is death. ROMANA: No schools of any kind? KALMAR: Children start in the fields as soon as they can walk, stay there till they grow up, grow old and die. In 1979, John Pilger, David Munro and Eric Piper traveled to Cambodia in the immediate aftermath of the overthrow of Pol Pot. What they found there was shared with the world, first in a special issue of the Daily Mirror and later in an ITV documentary, Year Zero: The Silent Death of Cambodia. Their discoveries were pretty much the same as the events described by Kalmar and this would have been clearly understood by the audience at the time. Doctor Who rarely commented on real-world events, so this is an interesting reference. DOCTOR: Do you know, it just occurs to me. There are vampire legends on almost every inhabited planet. DOCTOR: Yes. Creatures that stalk in the night and feast on the blood of the living. Creatures that fear sunlight and running water and certain herbs. Creatures that are so strong they can only be killed by beheading, or a stake through the heart. ROMANA: Or? Please, say something. DOCTOR: Whatever it is, we want to find it, don’t we? DOCTOR: Good. Come on then. The only downside to the story is the reveal of the Great Vampire, which is something of a disappointment. It would have been better to leave him to the viewer’s imagination as the brief glimpse seen in the last episode fails to convince in every possible way. This is only a minor niggle though and the Doctor’s solution to find a stake big enough to kill the Great Vampire is pretty ingenious. With Tom Baker’s time on Doctor Who drawing to a close it was a nice touch to have a story that harked back to the Hammer Horror style of his early years. This probably wasn’t intentional though, as it seems that the script was pressed into service because stories were urgently needed. But whatever the reason it was made, State of Decay is an effective tale from the pen of one of its longest-serving contributors. It’s not brimming over with originality, but sometimes you just need to borrow – and if you do so then borrow from the best. Change was most definitely in the air during the 18th season of Doctor Who. A new producer (John Nathan-Turner) and a new script-editor (Christopher H. Bidmead) were firmly in place, whilst an experienced old hand (Barry Letts) kept a watching brief as executive producer. Those who have been around Doctor Who fandom for a long period will probably recall the time when S18 was highly rated. This was at exactly the same time that some of fandom intensely disliked S17. But as S17 came back into fashion this seemed to dent S18’s popularity a little. It was now seen by some as a little po-faced and science obsessed compared to the free-wheeling S17. For me, both seasons have their merits and demerits and the dividing line between them can get a little blurred. Meglos, for example, could easily fit in to S17, whilst The Leisure Hive had originally been commissioned for S17. By the time we get to Full Circle, the third transmitted story, we are seeing more of the pure vision of Bidmead though. Without a doubt this season, for good or bad, was created in his image. He once estimated that he wrote about 70% of S18 and Full Circle is a story that he had a great input into, as he considerably reworked Andrew Smith’s original scripts. It doesn’t all work (there are some holes in the logic) but there’s a fine performance from Baker, particularly in episode three, and confident direction from Peter Grimwade which carries the story along. Bidmead is quite a divisive figure. The DVDs have allowed him the space to clearly state his vision of what he believed Doctor Who should be – a series rooted in scientific fact and definitely not drawing on popular books or films to pastiche. One can only wonder how he would have got on with Robert Holmes, although we can probably guess by the somewhat strained relationship he had with Terrance Dicks, who didn’t care for his rewrites on State of Decay. Bidmead’s extensive input across the season does mean that there’s a thematic unity unusual in Doctor Who at the time. The first six stories all portray civilisations that for one reason or another are stagnating. The Argolins are sterile, Tigella is a planet held back by the superstitious nature of the Deons, the Three Who Rule have deliberately devolved the development of their planet, the Tharils once enslaved others but now they find themselves enslaved while the inhabitants of the Traken Union live in harmony for as long as the Keeper lives. In the final story, the Logopolitans have been attempting to stave off the heat death of the universe by attempting to maintain stasis. But as the Doctor observes, entropy increases, and like the other stories of the season, change is inevitable. In Full Circle, the Alzarians seek to deny the course of evolution by sealing themselves in the Starliner until the danger they believe exists has passed. Theirs is truly a stagnant society – with ineffectual leaders, the ironically named Deciders, who are unable to make any decisions except to maintain an existence based on continual procrastination. Production-wise, this is an impressive Doctor Who directing debut from Peter Grimwade. The early episodes benefit from a generous amount of location filming and the location, Black Park, looks gorgeous in the sunshine. It looks so good that it’s surprising it wasn’t used more often in Doctor Who. The production was fortunate to shoot in sunshine, which enhanced the shots, but there was also clearly some thought given about how to depict an alien landscape. Grimwade used coloured lamps from just off-screen to bathe parts of the landscape in an unearthly glow. It’s a simple trick, but effective. Full Circle was, of course, the first transmitted story featuring Adric. In production terms Matthew Waterhouse had already recorded State of Decay, but as can be seen he’s still somewhat uncertain in the role. Given his lack of acting experience this isn’t a surprise – although a more actor-friendly director may have helped to refine his performance. But anecdotal evidence suggests that Grimwade wasn’t an actors director, so Waterhouse had to make his own way. He’s not noticeably worse than the rest of the Outlers though, who all have a whiff of the stage school about them. They’re fairly unrewarding parts but Richard Willis (Varsh), Bernard Padden (Tylos) and June Page (Keara) do the best they can. 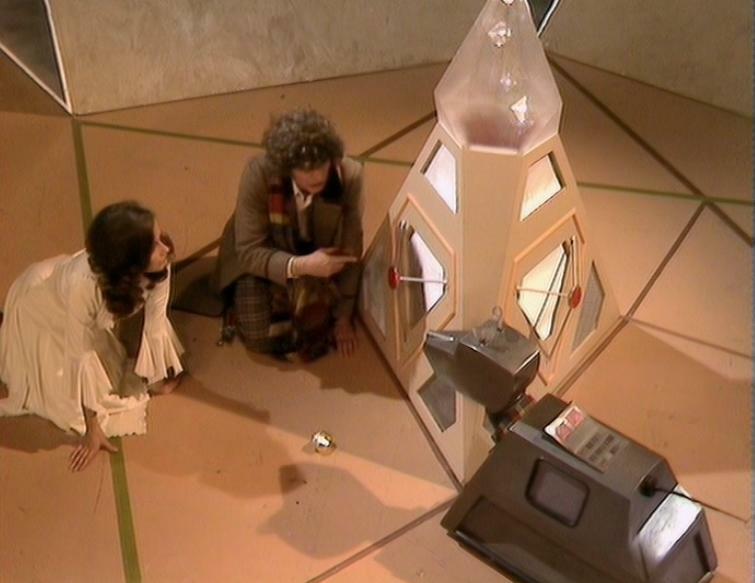 Although maybe it’s indicative of one re-write too many when Keara becomes suddenly intensely curious about everything in the last episode – possibly her lines were originally intended for Romana or Adric. We’re on much firmer ground with the Deciders – James Bree (Nefred), Alan Rowe (Garif) and George Baker (Login). Bree had previously given a strange performance in The War Games, where every line was drawn out to the nth degree, but he’s far, far, better here. Bree plays it like many a politician or manager promoted way above their ability – he is able to project a calm outward exterior whilst having no original or helpful ideas of his own. Alan Rowe, a familiar face from his guest appearance in Horror of Fang Rock a few years earlier, is equally indecisive as Garif. As previously mentioned, the title of Deciders is obviously intentionally ironic, but both of them are lucky to have a new Decider who knows his own mind in the form of George Baker. Episode one establishes the planet and the mystery of the negative co-ordinates before ending on the emergence of the Marshmen. As monsters incapable of speaking, for a large part of the story the Marshmen are simply used as figures to menace the Alzarians. But the Marshchild shows that they are intelligent, reasoning creatures who have a closer relationship to the inhabitants of the Starliner than at first thought. Episode two is where the story begins to kick into gear as the Doctor meets the Deciders and can begin to understand exactly what is happening on the planet. In episode three the Marshchild dies and enough groundwork has been laid to ensure that we don’t regard it as just another monsters death. 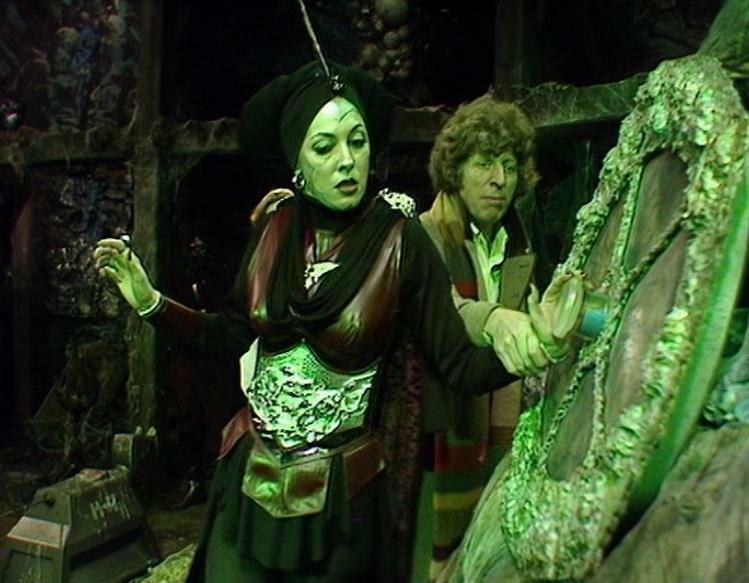 The Doctor’s link with the creature means he reacts with a fury that hasn’t been seen for a few years (since the conclusion of The Pirate Planet). It’s a wonderfully acted scene from Tom Baker. DOCTOR: You Deciders allowed this to happen. GARIF: The marsh creatures are mindless brutes. Animals! DOCTOR: Yes. Easy enough to destroy. Have you ever tried creating one? NEFRED: We were within our rights. GARIF: One might argue that Dexeter was overzealous. DOCTOR: Not an alibi, Deciders! You three are supposed to be leaders. GARIF: Certainly we are. Though, of course, Nefred is, er, is now First Decider. DOCTOR: Then Nefred is responsible. NEFRED: For the community, yes. DOCTOR: No, no! Perhaps they haven’t let you in on the secret, Login. Shall I tell him, gentlemen? DOCTOR: Yes! And the fraud of perpetual movement. The endless tasks going round and round. The same old components being removed and replaced. We haven’t yet discussed the other regulars. Lalla Ward gets an episode or so where she’s possessed by the Marshman. Although Sarah-Jane Smith used to get taken over on a regular basis it’s not something that has happened before to Romana, so it has a little more impact. Poor K9 finds himself decapitated half way through, which is a clear sign that his days are numbered. “You can’t fight the Time Lords”. The eventual solution to the mystery in episode four is something that may have been clearer in early drafts. The notion that the Marshman boarded the Starliner when it first landed, killed the occupants and then gradually evolved into the Alzarians is possibly not too explicit in the dialogue – so anybody watching for the first time might have missed this important plot twist. And if the Starliner has been on the planet for 40,000 generations, how many generations passed until the Marshmen evolved into the humanoids we see today? It surely couldn’t have taken all of that time, so why have the Marshmen not been able, until now, to board the Starliner again? After a slightly shaky start with The Leisure Hive and Meglos, S18 really started to gain momentum with Full Circle. And there was even better to come. Ranking a lowly 211 out of 241 stories in DWM’s recent poll would imply that The Creature from the Pit isn’t a favourite of many. But apart from one (admittedly large) problem it’s difficult to see why. The positives far outweigh the negatives – the jungle scenes at Ealing give the episodes a glossy sheen, Myra Frances is a gloriously hissable villainess, Tom’s on great form, Lalla looks lovely and there’s an entertaining guest turn from Geoffrey Bayldon. The problem? Well you can’t really avoid it. Erato is a vast, shapeless blob that is said to stretch for miles. How do you realise that on Doctor Who’s budget in 1979? The answer is, of course, that you can’t. So Erato looks like an inflatable green bag with a rude appendage. But the scenes in the pit are nicely lit and Erato’s green glow is quite eerie, so it’s not a total write off. No, sorry I can’t think of a caption. Please add your own. Producer Graham Williams was in no doubt that the special effects department had let the programme down and after transmission made this point in an internal memo. But it’s hard to imagine how this monster could ever have been successfully created, so you do have to wonder why this was never queried at the scripting stage. 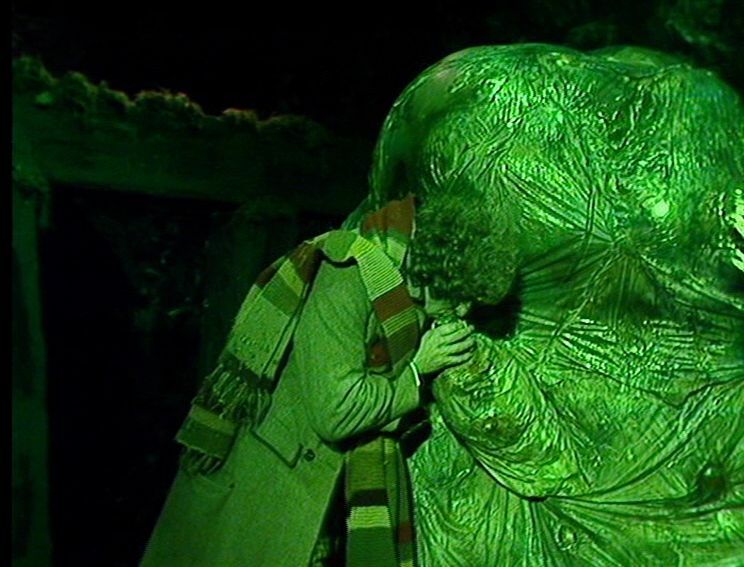 New script editor Douglas Adams wasn’t terribly experienced, but Graham Williams had been around for a while and should have twigged that a mile wide green blob was simply asking for trouble. But whatever the merits and demerits of Erato, there’s plenty to enjoy in this story, so let’s take a closer look. Chloris is a planet rich in vegetation but low on metal. The Lady Adrasta (Myra Frances) owns the only metal mine on the planet and therefore is able to rule with a reign of terror. But the arrival some years ago of an ambassador from the planet Tythonus has threatened her grip on the planet. Erato proposed a trade – they have plenty of surplus metal but Tythonus is extremely low in vegetation which Erato’s people need in vast quantities. Adrasta quickly understood that if she no longer had the metal monopoly then her power would dissipate. So she arranged to banish Erato to the pit and would henceforth throw anybody who displeased her down there. 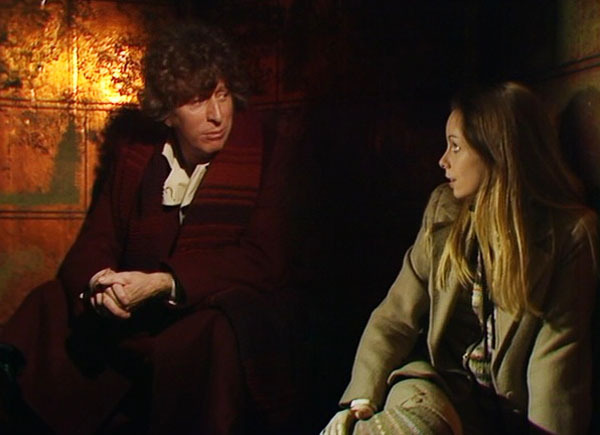 Although transmitted third, this was the first story of Season 17 to be recorded, so it was Lalla Ward’s acting debut as Romana. Her performance here is subtly different as she was still feeling out the part. There’s some nice moments from her though – particularly when she confronts the bandits in their lair. The guest cast is uniformly solid. Myra Francis manages to be gorgeous and deadly at the same time. Eileen Way (Karela) had appeared in Doctor Who’s first story back in 1963 and is good value as Adrasta’s right hand woman. Organon (Geoffrey Bayldon) is a hapless astronomer who falls foul of Adrasta and found himself flung into the pit. Managing to avoid being crushed by the monster he has lived a lonely existence until the Doctor turned up. Bayldon, best known for Catweazle, sparks off Tom very well and their scenes together are highly entertaining. Also skulking around the jungle are a group of inept bandits, lead by Torvin (John Bryans). There has been some criticism of this character over the years, so the viewer will have to decide if he’s a riff on a Fagin-like character or simply a broad Jewish stereotype – “My lovely boys”. So while Creature has its flaws, if you can ignore the glowing green bag there’s plenty of entertainment here. Unloved for decades due to its feeble dinosaurs, in recent years there seems to be more appreciation for Malcolm Hulke’s Invasion of the Dinosaurs (1974). So maybe one day the same thing will happen here and fandom will learn to stop worrying about Erato and love The Creature from the Pit. 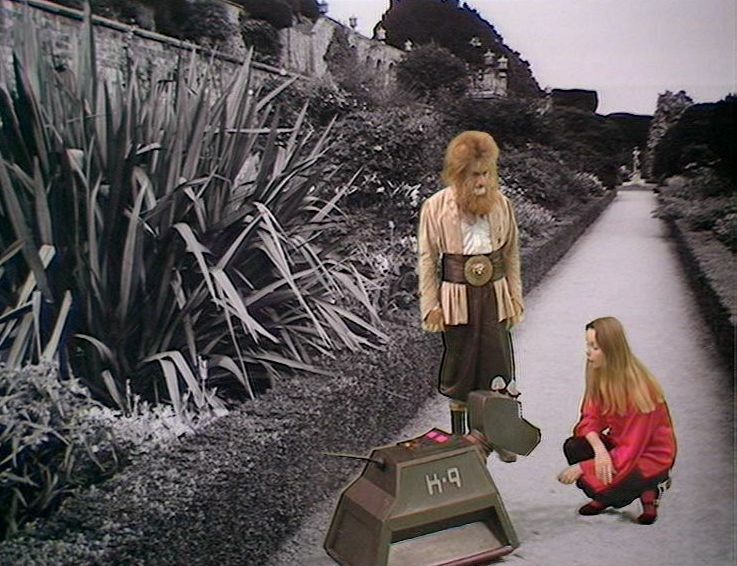 A nice clip of Nationwide from 1980 with Lalla Ward and K9. A rare public outing for Roger Brierley as the voice of K9 (Brierley had taken over K9’s vocal duties for a year after John Leeson left the series following the conclusion of the Key to Time season). Nobody loves The Armageddon Factor. Ranked 204 out of 241 stories in the recent DWM poll would appear to be a fairly accurate confirmation of its low standing. But before we turn our attention to the story, lets have a quick look and see how its rated by some other bloggers. Philip Sandifer considers that it’s “a painful squandering of good will in a way that only deepens the concern that the series has lost its way” whilst the Wife In Space called it a complete waste of time and rated it 4/10. In his three years as producer, Graham Williams never had much luck with season finales. Season 15 was going to conclude with a story by David Weir, until it was realised that his draft scripts would have needed a Star Wars-sized budget to make them work. So Williams and script editor Anthony Read had to cobble something up at the eleventh hour. 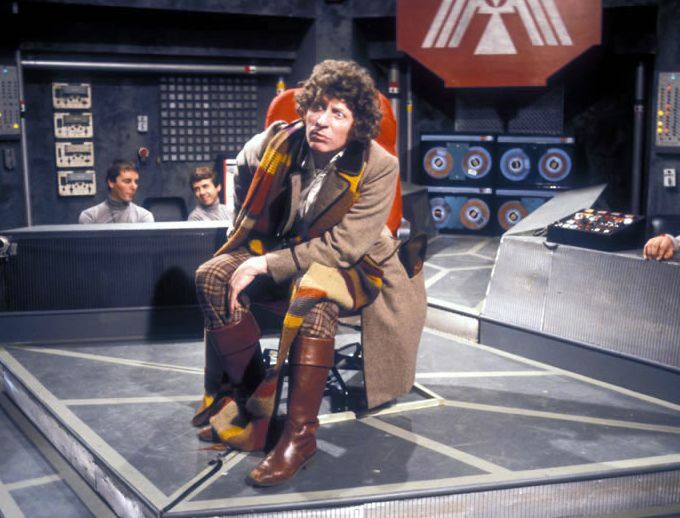 The resulting story, The Invasion of Time, was something of a shambles – not helped by a BBC strike which meant that the production lost half of its studio allocation, so they were forced to decamp to a disused hospital to record some of the interiors. Season 17 was even worse. Douglas Adams’ Shada was also hit by a strike, but this time there was no opportunity to record the material affected by the stoppage, so the programme was never completed or transmitted. But over the last thirty years it has spawned VHS, DVD, audio and book releases – and a notoriety that the original story probably never deserved. This leaves the last story of Season 16 – The Armageddon Factor. This was not affected by strikes or last minute rewrites, but there does seem to be something somewhat lacking. In late 70’s Doctor Who if you weren’t careful, by the end of the season you may have run out of money so your season finale would end up looking a little threadbare. This is how Armageddon looks – no location filming and rather basic sets. 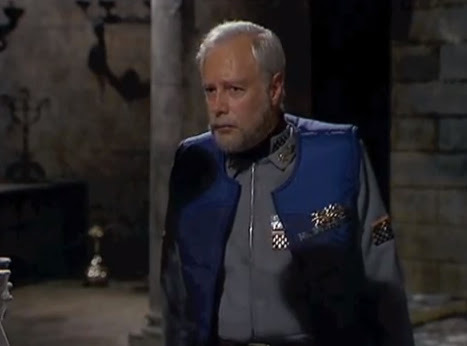 But the early episodes are helped no end by John Woodvine’s appearance as The Marshall. Woodvine is a quality actor and he also has the welcome benefit of making Tom Baker raise his game. There are other examples of this – Julian Glover in City of Death for example – so casting strong actors in late 70’s Who was clearly a good way to get Tom to focus on the matter in hand. By this time, Tom had been in the role for five years. No actor had played the part for longer, and he still had another two years to go. Given this, it’s probably not surprising that there were times when he either seemed to go through the motions or dropped in the odd outrageous ad-lib. Having said that, the commonly held view that Baker was playing the fool throughout the Graham Williams era is quite clearly untrue. There’s the odd double take and painful pun, but for most of the time he plays it straight – although not everyone else is on the same page. For example, Davyd Harries, as Shapp, puts in various bits of business that either director Michael Hayes approved of or didn’t notice. It’s amusing enough though and does help to pass the time during some of the less interesting passages in the first half of the story. Because apart from Harries and Woodvine, the guest cast are fairly small and not of great interest. 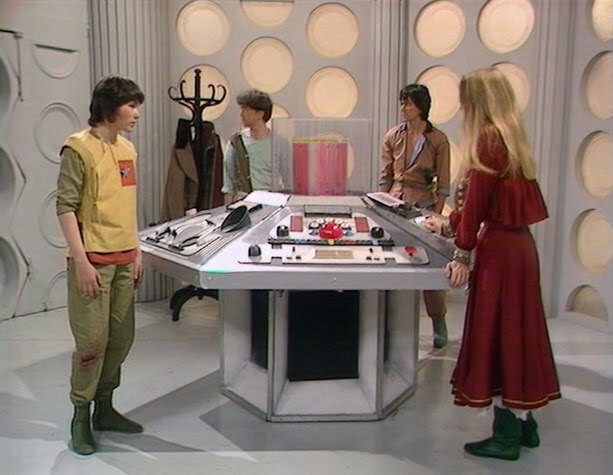 Lalla Ward would quite soon prove to be very important both to Doctor Who and Tom Baker, but there’s very little for her to latch on with the character of Astra. And Ian Saynor has even less of a character, if that’s possible, with the irredeemably wet Merak. That leaves William Squire as the main villain, The Shadow. Squire was a good actor, probably best known for playing Hunter in the two Thames series of Callan. But The Armageddon Factor takes the strange decision to put him in a mask and also treated his voice, thereby making him unrecognisable. The Shadow isn’t much of a part anyway, as he tends to speak only in evil-villain talk and then give the odd maniacal chuckle. It’s a long way from the best villains of the Hinchcliffe era, such as Davros, Sutekh, Harrison Chase and Magnus Greel. The Shadow seems to have no interest beyond obtaining the last segment of the Key to Time, and therefore he can’t expect to hold the audience’s interest. The story was scripted by Bob Baker & Dave Martin, who had been writing for the series since 1971. This was their last joint story for the series and it’s probably fair to say that very few people have ever expressed any regret that they didn’t carry on writing for the show. They were not always bad, and sometimes quite good, but they tended usually to be pretty average. But a safe pair of hands then, and just what Graham Williams needed to bring The Key to Time Season to a conclusion. This they do, although the ending in particular has always been viewed as something of a damp squib. 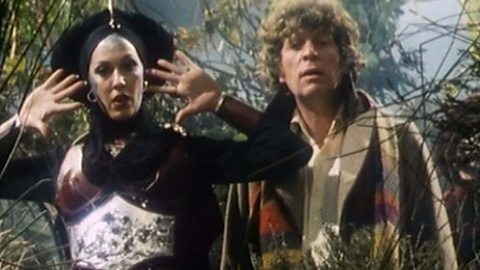 After a season of the Doctor and Romana searching the universe for the six segments of the Key to Time, the conclusion of this epic quest is thrown away in such a perfunctory way. Script editor Anthony Read should have been able to fashion something better, but didn’t – unless the original proposal was even worse. But having said all this, is the story totally unwatchable? No, of course not. The first half of the story is better than the second, since John Woodvine gets stuck in a time loop in episode four and has little to do from then on. We are also denied Davyd Harries’ comedy pratfalls later on, and Barry Jackson – as cockney Time Lord Drax – is no substitute. Remember me to Galifree. Tom Baker and Mary Tamm are both still giving it their all though. It might have been a long season, but they are committed and do their best to make the most of the thin material. 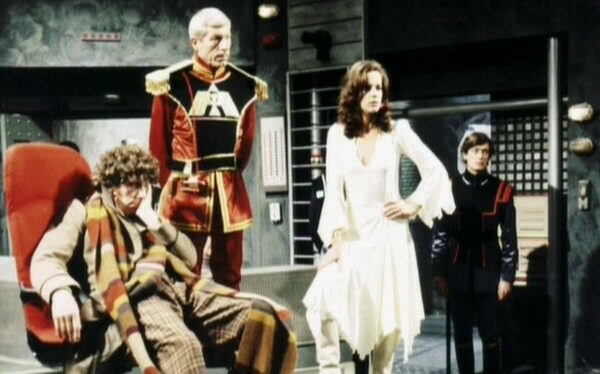 This was to be Tamm’s last television appearance as Romana and although she tended to be overshadowed by Lalla Ward’s portrayal of Romana II, Tamm had a good rapport with Baker throughout the Key To Time season and remained popular with fans right up until her untimely death, at the age of 62, in 2012. 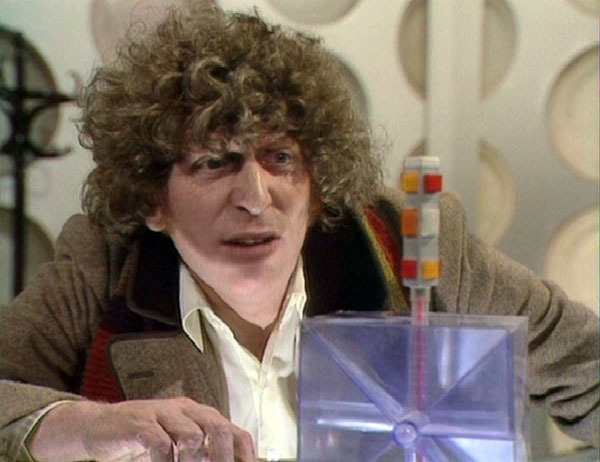 Overall then, The Armageddon Factor is never going to be regarded as a great or even a good story – but there’s far, far worse out there and Tom Baker, Mary Tamm and John Woodvine all do their best to to inject some energy into it. If I had to rate it, then a solid 6/10 would seem about right.